Update: Unfortunately, Mattarello closed back in early 2011. The one thing about getting back from a 4-day cruise is that you’re not terribly hungry. After several days of heavy dinners and the like, Carol and I were ready to tone it down a little bit, and go explore South Beach while finding a nice snack to tide us over to dinner. Luckily, South Beach has no shortage of restaurants, pizza joints, and food stands, so it was mostly a matter of wandering around until we found something that tickled our fancy. What we found was Mattarello Bakery Cafe. Mattarello is quite the unassuming little Italian deli and bakery, one of those store fronts you can easily walk by without ever noticing. However, we noticed that their front window was filled with some very nice pizza, some random roasted beef bits, and some good vegetables. Going inside, there wasn’t much more inside, mostly several varieties of Italian bread, and a mostly empty refrigerator case holding little more than a small selection of focaccia sandwiches and some Italian hams. Despite this, the sandwiches looked good, so Carol and I both ordered sandwiches (Carol opting for a salami sandwich, myself opting for a proscuitto and cheese sandwich). As it turns out, there’s quite a good reason the refrigerator case at Mattarello is nearly empty. It’s nearly empty since the focaccia sandwiches are so good they flight out the door almost as fast as they can make them. 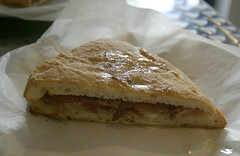 My Proscuitto Sandwich sandwich was a seriously good sandwich, the meat (proscuitto) and cheese (provolone) were spot on, and the focaccia was nice and crisp and toothy without being too firm or greasy. Carol’s salami sandwich was similarly good. 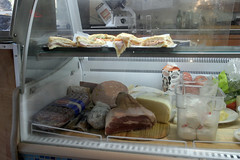 Seriously, they’ve got the bread dialed in here, as well as having some top notch hams and salamis to round it out. 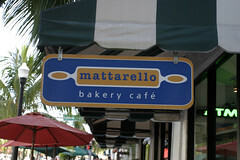 So, if your in South Beach and looking for a good sandwich for lunch, Mattarello is an excellent option.